Laying sod is the fastest, and one of the easiest, ways to start a new lawn. If you live in Texas, the chief concerns when planting a lawn from sod are choosing a species of grass that grows well in your area and making sure the new lawn gets plenty of water. Before installing, perform a soil test to see if any amendments are required. The particular species of sod grass you choose should fit your U.S. Department of Agriculture plant hardiness zone, as well as local climate conditions. St. Augustine grass (Stenotaphrum secundatum, USDA zones 8 through 10) grows best in southeast Texas and has a high tolerance for salt that makes it useful along the Gulf coast. Depending on the cultivar, St. Augustine has a good tolerance to shade but does not work well in areas with high traffic. Bermudagrass (Cynodon spp, USDA zones 7 through 10) and zoysiagrass (Zoysia spp, USDA zones 6 through 9) are both fairly drought-tolerant and grow well throughout Texas. Bermudagrass does have invasive tendencies and does not tolerate shade well but does tolerate traffic. Zoysia has a moderate tolerance to shade and traffic. In areas with less than 25 inches of annual rainfall, like the interior plains in southern Texas, buffalograss (Buchloe dactyloides, USDA zones 5 through 9) is probably the best choice but requires a sunny location for the best performance. Before you order the sod, remove weeds from the lawn area and work the soil to a depth of 4 to 5 inches. After tilling, rake the soil to smooth out the surface and remove rocks. To find out how much sod to order, calculate the total square footage of your yard. Sod is sold by the square yard, which equals 9 square feet, so divide the total square footage of your yard by 9 to find out how much sod to order. You can buy and lay any species of sod grass year-round, but it's easier to establish the warm-season grasses grown in Texas in the early summer when the weather is neither very hot nor too cold. 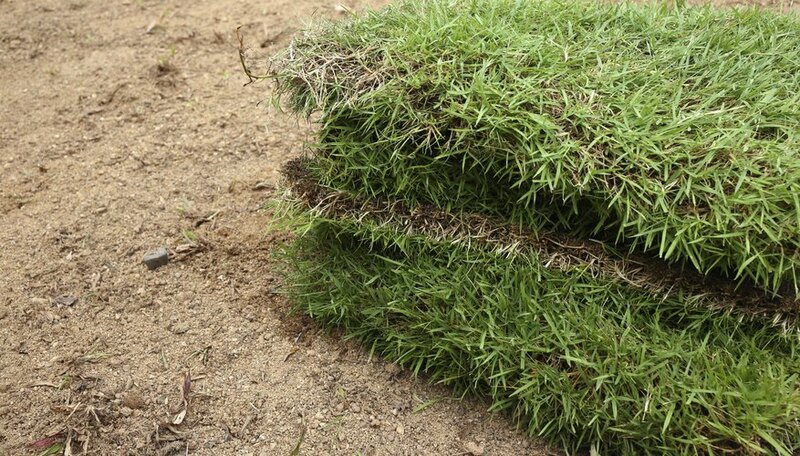 Sod is best planted within 36 hours of delivery, and preferably as soon as it arrives. Before planting, lightly water the soil. Start laying sod along a straight boundary, like a driveway or sidewalk, and push the edges of the sod snug against each other but without overlapping. Stagger the next rows to create a brick-like pattern. If you need to cut the sod, use a clean, sharp knife or spade; do not cut pieces less than 9 inches wide, because they will dry out quickly. Pay close attention to the sod and lawn soil as you're working, and water as needed to keep everything moist. This is particularly important in the warm climates common to most of Texas. After planting, roll the sod with a water ballast roller to ensure good contact between soil and roots. Begin watering the sod within half an hour of planting. Be sure to use enough water to soak the soil across the entire lawn to a depth of 4 inches. For the first two weeks, water the sod at least once every day to keep it from drying out. Once-a-day watering works best in areas of Texas with high annual rainfall, because rain will supplement the irrigation. In areas like the interior plains and central hill country where there is less rain, or north-central Texas where rainfall is sporadic, you may need to water the sod more than once a day to keep it moist. After the first two weeks, cut back to watering every two to three days, or enough to keep the soil moist, but not wet, to a depth of 4 inches. Keep traffic to a minimum while the sod establishes itself. Start mowing only after the sod is rooted -- which you can check by gently tugging on the corner of a piece of sod. If it stays in place, the sod has rooted. For the first few mowings, set the mower deck higher than usual to avoid stressing the lawn.